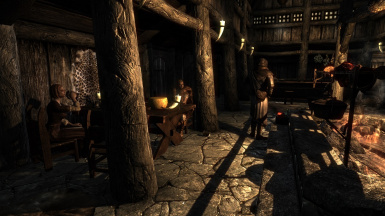 Gives each Tavern in Skyrim an individual overhaul and adds a bathing room to each Tavern. 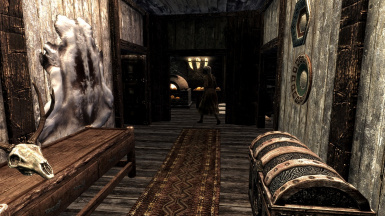 I had overlooked adding back some GS chests in the 2.7.1 GS version of the mod, the following locations have been added again: Winking Skeever in Solitude, the New Gnisis club in Windhelm, the Mixwater Mill workers house, Sinderlions Laboratory in Blackreach, and the Storeroom of Mzulft. Some of these chests are not exactly where they were in older versions as I figured new factors into placing them. 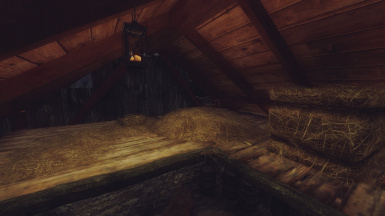 New location added is the Drunken Huntsman in Whiterun; I made a loft by the stairs for the chest so it should work with most mods that alter that interior. 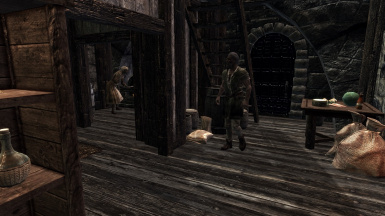 Fixed a Navmesh issue with the main path in Dawnstar between the Tavern and the Barn; the navmesh had not properly finalized and so the path was interrupted for NPCs. Uploaded a General Stores version of this fixed version as well. First of all I skipped over 2.6 here because I made a 2.6 version for SSE only and this mod includes those changes and then some more. So I will port this version also to SSE and then both files are the same again. New: All interior doors in Taverns were turned to open into the room, this avoids smashing doors into the player or Innkeeper. Including some vanilla doors such as the double doors in the Bannered Mare. 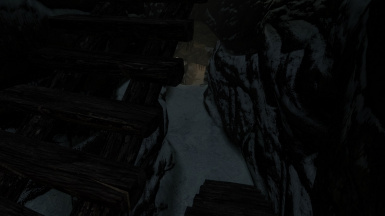 The door to Nelacar's shop at the Frozen Hearth in Winterhold opens against the wall now and does not block the enchanter. Turned some benches that were against a wall into the room as they are accessed from behind and NPCs could get stuck in walls or vanish. Minor navmesh adjustment where needed. Adjusted the navmesh of the Ivarstead barn to hopefully avoid animals in it warping out of it. 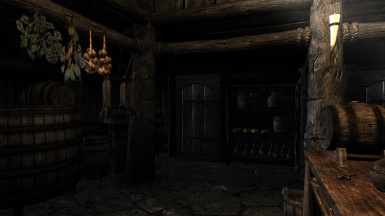 Added bread ovens with supplies to the Basements of the Bee and Barb in Riften, and the Winking Skeever in Solitude; New Gnisis Club in Winterhold got an oven upstairs. Now every Inn has an Oven! Added a missing structural post in the basement of the New Gnisis club, and closed some gaps on the basement floor boards. Added a stepping stool by the cooking oven in the Winking Skeever so that Player or NPC using that pot won't float a foot off the ground. Added a stool under decorative clutter next o oven. Main changes are 3 Barns added in Winterhold, Dawnstar and Ivarstead. Each barn is individual in style, has room to ride your horse into and a hayloft where the player can also sleep and store gear. The downstairs of the barns is navmeshed and the locations should be compatible with most City mods such as JK's and Winterhold Rebuild. Per request I added an Oven to the Bannered Mare in Whiterun and also changed the door style to the Bathing room to a Whiterun door. In the GS version only: Added a missing Master chest to the Winking Skeever in solitude, added GS crafting containers to Dark water crossing, Stonehills camp, and Karthwasten mining camp. All changes of the basic 2.4 apply. In addition added some warming hands idle markers that I had overlooked in 2.3GS in the Retching Netch and the Vilemyr Inn. Reduced the size of the wolf pelt pile at Deadmans drink to reduce collision sticking into the room. I switched out all the load doors to Bathing rooms with "Minimal use doors" this is in addition to assigning each bathing room to its Inn. Hopefully this will eliminated NPCs getting stuck in bathing rooms as reported by some users. The farm house doors used do not have an animation, so load times are even slightly faster. Same changes and fixes as in the 2.3 main file. All bath locations have been linked to their respective Taverns, this will hopefully fix radiant quests getting directed to the bathroom cells. Added hand warming idles to all bathing room fire places. Removed deer pelt containers that had collision box issue and replaced them with bear pelt bundle as container. Fixed a wall gap at the Ivarstead bathing room. Moved the sleeping marker for the homeless child behind the Bannered Mare to just outside the bathing tower, should work again for adoption quest. 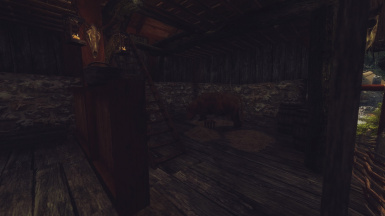 Added a wolf pelt container to the basement at the Fort Dunstad Tavern. Added a flower vase container to a guest room at Candleheart hall. 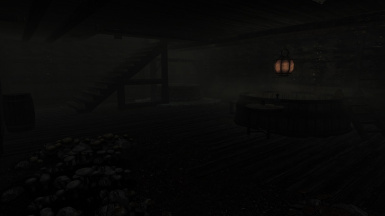 Added a missing GS chest to the Winking Skeever in Solitude; added various hand warming idles to bathing rooms. So far updated only GS version. All versions are now compatible with "Moonpath to Elsweyr". In the Dead Mens drink in Falkreath, moved a table and chairs to make room for portal, but still looks alright and works if you do not have that mod installed. Moved sweep marker, added two bar stools, and adjusted navmesh, moved wall hanging to large room. 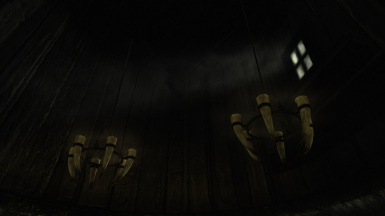 Moved missing steam into place in two baths; Candleheart Hall and Old Hrolden Inn. 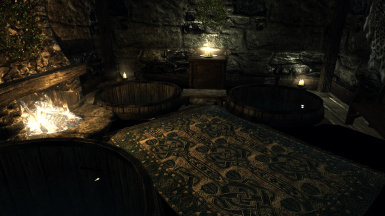 Added a laying down marker to one of the fur rugs in the Silver blood Inn bath for NPCs to interact with. Replaced unstable shadow light at the cooking fireplace with a no shadow light, covered the gaps in the floor in front of the fireplace, added a bed to the upper most floor, moved some clutter. In the Ravenrock version, all changes as in standard file, plus added a light above the Oven, removed a duplicate door. In the Old Hrolden version, all changes as in standard file. In GS version, all changes as in standard file. Welcome to Friendlier Taverns with Baths and Barns. Wow made it to Hot-files within the first week! Thank you all for your awesome support. This a first for me and I am very thrilled that this labor of love was so well received! Check out this nice video by DonProtein, thanks a bunch! Updated version is up! Now both versions work with Moonpath to Elsweyr and Ravenrock Expanded, no patched file necessary! check change log and Sticky post for complete list of changes and fixes! I do not plan to update a patched version for Old Hrolden compatibility, sorry. I recommend manual download to desktop and then use NMM to install the mod. Or place the files from your desktop into your Skyrim Data folder manually in the corresponding files if you do not use a manager. About using LOOT for load order! Do not rely on LOOT to always know the best load order; several people reported crashes after adding this mod to their game and letting LOOT decide where it should go; when moved manually in the load order the crashes stopped. It depends entirely on what else you have loaded but if you experience crashes then change your load order before reporting a problem with this mod, thank you! This is a new release of my old mod Friendlier Taverns with bathing rooms added to each Tavern. 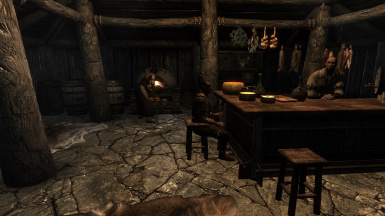 Each Tavern in Skyrim has been individually remodeled to make the sitting arrangements more welcoming and diverse in furnishings. No more cookie cutter look no matter what Tavern you walk into. A number of custom models have been added to serve as safe containers and or decorations. 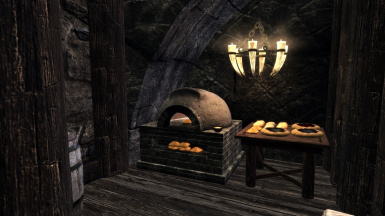 Most taverns now have bread ovens. 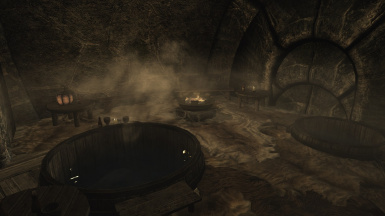 In this version now every Tavern in Skyrim also has a walk in bathing room, fully navmeshed so followers can go in with you. The bathing rooms are attached at floor level at the country side Inns as round silo towers, and so are also circular on the inside. These feature circular wooden tubs and followers will use them though not easily come out of them, but always follow behind you when you leave the bathing room. 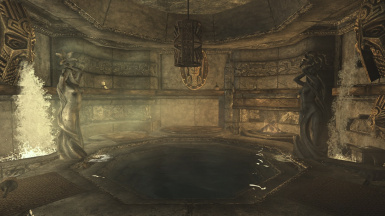 The bathing rooms in major cities are more individualized and made in the style of that city with the one in Markarth probably being the most elaborate with a pool in the Dwemer style. 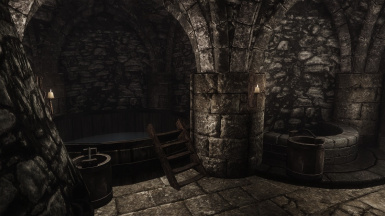 Every bathing room is a bit different just as the Taverns are individualized and will have between 1 to 3 tubs and slightly different features like fire places, spouts etc. I think the doors will be pretty obvious, but they are placed mostly in the right far corner in all country Inns, behind the bar and next to the large room. 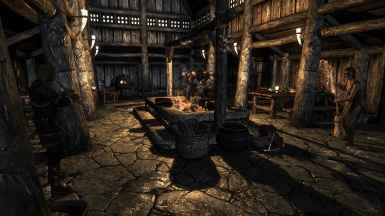 Markarth Silverblood Inn door is to the right of the fire place; Solitude The Winking Skeever in the open basement no loading door; Riften basement at the foot of the stairs; Whiterun main hall to the left of the bar; Windhelm Candlehearth hall, at the foot of the back stairs; Retching Netch Ravenrock on Solstheim hallway opposite the bar. 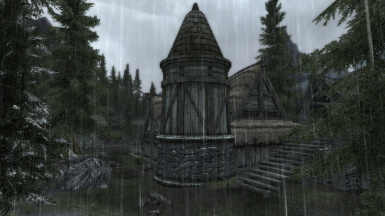 Cities that have the same house type for an Inn as small villages also have the Silo type round tower attached to them, such as Falkreath, Morthal and Winterhold; Dawnstar has a square hut design attached to the Frozen Hearth. 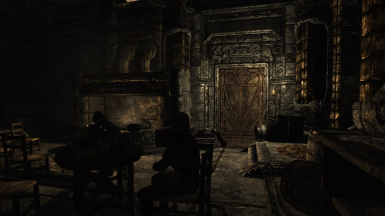 The New Gnisis Corner Club in Windhelm got a more extensive overhaul with dimmer lighting and Dunmer style lanterns. 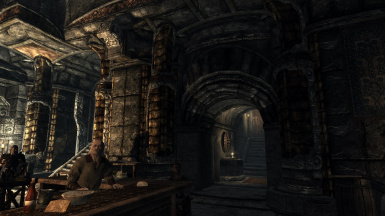 It features also maps of the old homeland and food and beverages you can otherwise only get on Solstheim. It has a full basement now that features a bathing tub a mushroom farm and a secret tunnel through a well that will lead you outside the city walls. You can also enter the city that way and it is fully navmeshed. It now feels more like a true Dunmer enclave. 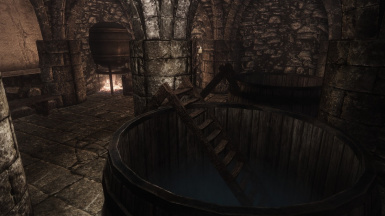 There is one abandoned Inn at Fort Dunstad and it also has a bath in the basement, so clear out those bandits for a dip. The Workers house at Mixwater Mill has now a working fireplace and cooking station and one custom container. Just meant as a stop over shelter. 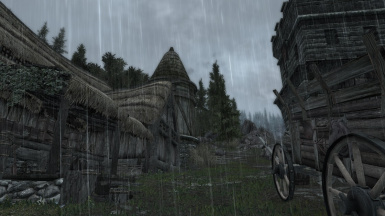 Three locations have now a large barn and stable near the local Inn; Winterhold, Dawnstar and Ivarstead. 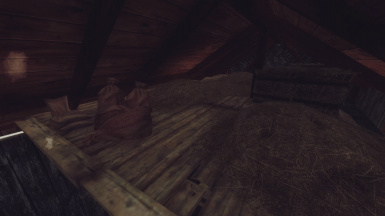 They are all a bit different in style and layout and you can find some random loot in them and also sleep in the hayloft. The reason I did not cover other Towns is for logistical reasons as placing a large barn conflicted with too many mods in other locations. These three will work with most city enhancing mods for these locations. 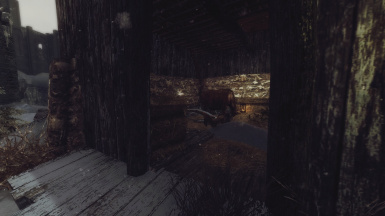 See my comment about "Immersive Stables" in my recommended mod section below. This mod requires both the Hearthfires and Dragonborn DLCs! My apologies I made that not more obvious, luckily most of you figured that out by the looks of it. 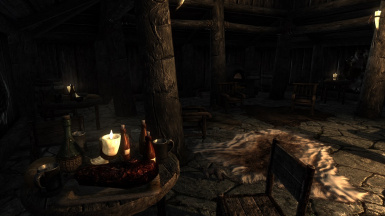 This mod should be compatible with any mod that does not change the interior layout of any Tavern, including Navmesh! Exterior changes are minimal and should be compatible with most City enhancing mods. For example most of Jk's mods work fine with this, but in some locations clipping can occur. I tried what I could to make the placement of the Towers as compatible as possible, but due to the vast number of mods that change Towns and Cities that is nearly impossibly to please everyone. 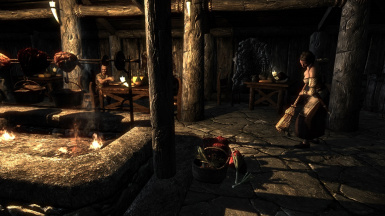 Mods that add NPCs especially in Taverns work fine with this mod such as "Interesting NPCs" or any number of follower mods. Works well with ClefJ's Rorikstead which I personally like very much. 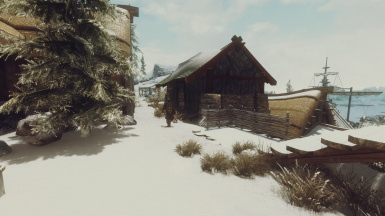 The mod should work well for Frostfall users or other survival mods, since now you can cook and bake at the Inns and the baths should help if you are already suffering from hypothermia. The tubs are currently not "heated" but because the rooms are so small and all baths have some heat source I believe that the proximity to the fire will have the same effect when you sit in a tub. Feedback welcome, I have not used Frostfall ever since Chesko's Campfire came out. Reportedly Immersive Citizens does not work with this mod as its AI placement is based on the vanilla Navmesh. 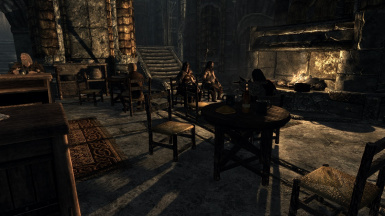 Friendlier Taverns with Baths-V2OH, patches "OldHrolden" V2.1 by Shezrie to work with my mod. What you get is access to the bath, and the bathtower on the exterior. Make sure you load my file after Shezrie's! This patch was made possible by Refurbmadness, many thanks to her! Friendlier Taverns with Baths-V2R, (Obsolete older file!) adjusts the Retching Netch in Ravenrock to work with "Ravenrock Expanded"
It required moving the load door to the bathroom which is right opposite the rentable room now, very convenient actually. I also had to move the bread oven as RE places a bedroom for the owner of the bar in the former storage room behind the bar where I had placed the oven. Friendlier Taverns with Baths-General Stores version; places master storage chests in all Taverns that are inter connected. You can drop off or retrieve gear at any tavern, much as in the Witcher game, but what is more if you have a GS enabled home such as my "Island Hobbit Home" GS version for example, you can drop loot at an Inn and later retrieve it at home. May not be "lore friendly" but think of it as a very practical enchantment. 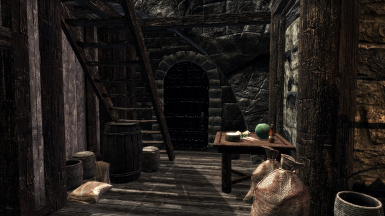 In addition to all Inns you can find chests in the following locations: Workers Cabin at Mixwater Mill, Sinderions laboratory in Blackreach, Abandoned Tavern at Fort Dunstad, Mzulft Storeroom and now also a second location in Whiterun at the Drunken Huntsman. Special thanks to RefurbMadness for her help, inspiration and wonderful statics that I used for many containers. Be sure to visit her mods page too. Thanks to Bethesda for a game that requires improving and to provide the tools to do so. For those already using my mod "Friendlier Taverns" Simply install this file over the old one. I did not change the esp. name so you can upgrade with no hassle to your save game. 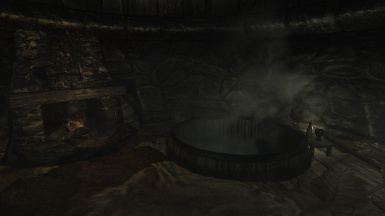 Bathing in Skyrim for actual bathing and shower animations to fully enjoy the baths. Go to Bed for an immersive sleep experience when you rent a room. Lets get Naked for obvious reasons. Immersive Stables-Vanilla Edition, enhances all the vanilla Stables at the major Cities, I recommend it. The mod by the same author "Immersive Stables" unfortunately conflicts with my mod at several locations at smaller towns. If you enjoy this mod please take a look at my other mods, just follow this link! Adding permanent bathers in some baths.